If you live near or will be traveling through Athens, Ohio this coming weekend, stop by the Athens Area Fiber Faire to pick up either gorgeous finished handmade items or the raw materials to make your own designs. Kreinik will be there, showing shimmery metallic threads and luscious silk fibers. The event will feature classes in spinning, felting and knitting, but there will be plenty of activities and vendors around all kinds of techniques. Fiber fairs like these are new hot-spots for picking up supplies, meeting fellow fiber enthusiasts, and making connections with makers and shops. If you've never used Kreinik threads, this is a great way to feel the fibers first-hand and talk with Kreinik staff. Janice and Rebecca will be there on Saturday, and Doug Kreinik will be there on Sunday. With the weather just about perfect this time of year, it will be a fun day for all ages. You can shop for supplies or pick up gifts for the holidays while your kids help form a giant pom pom or help stitch a community quilt. The event is Saturday and Sunday, October 4 and 5, 2014, at ARTS/West, 132 W. State Street in Athens, Ohio. For more information, visit the Athens Area Fiber Faire on Facebook (https://www.facebook.com/athensareafiberfaire) or Ravelry.com, or email faire organizers at athensareafiberfaire@gmail.com. Have you tried string art lately? No need to get out the hammer, nails, wood plank, and sailboat outlines. 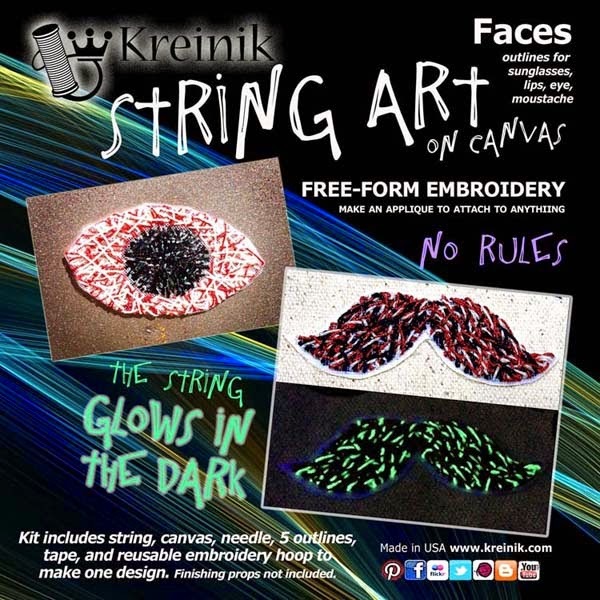 You just need to pick up one of the new String Art on Canvas kits from Kreinik. 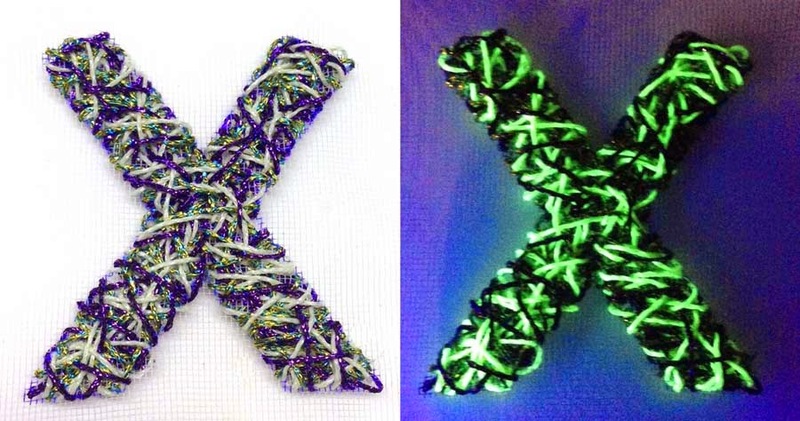 They're smaller, easier, portable, and use metallic and glow-in-the-dark threads. No, this isn't your 1970s string art—it's modern materials in a retro technique, it's making your own decal or patch you can put anywhere, and it's a kit you can use to teach kids how to stitch. New for the season is the Halloween kit, with outlines for witch's hat, bat, pumpkin, cat, haunted house and spider. The kit includes everything you need: thread(string), needle, canvas, outline, and a reusable embroidery hoop. Did we mention that the string glows in the dark? Halloween bats, witches, spiders and pumpkins have to glow in the dark, we're pretty sure it's in the holiday rule book. You can stitch a design in less than two hours, while you're watching sports or tv, sitting in a waiting room, waiting in the car… When you're done, attach it to anything for a fun, insta-patch. Want to see more? Visit our website for the complete collection of String Art on Canvas kits, or ask your local needlework store for them. If you don't have time to stitch, these are the perfect projects to get kids stitching, to get them using a needle and thread. Kids and teens love quick, easy, free-form embroidery, and here it is, in a cute little package: Kreinik String Art on Canvas kits. The next generation of stitchers—those under 20—call thread "string" and hold a needle like a touchscreen stylus. They like making things but don't like rules. They value freedom and self expression as daily life presents boredom, school, homework, and growing-up pressures. And they love the new String Art kits from Kreinik. You remember string art, don't you? Wrapping colorful yarn around nails hammered into wooden boards to create pictures like animals and spirotot shapes. Today's string art style has advanced with modern tastes and trends: it uses metallic threads on different surfaces and in modern patterns. The designs and ideas are available in new and coming-soon kits from Kreinik. Look for the Kreinik String Art On Canvas series. 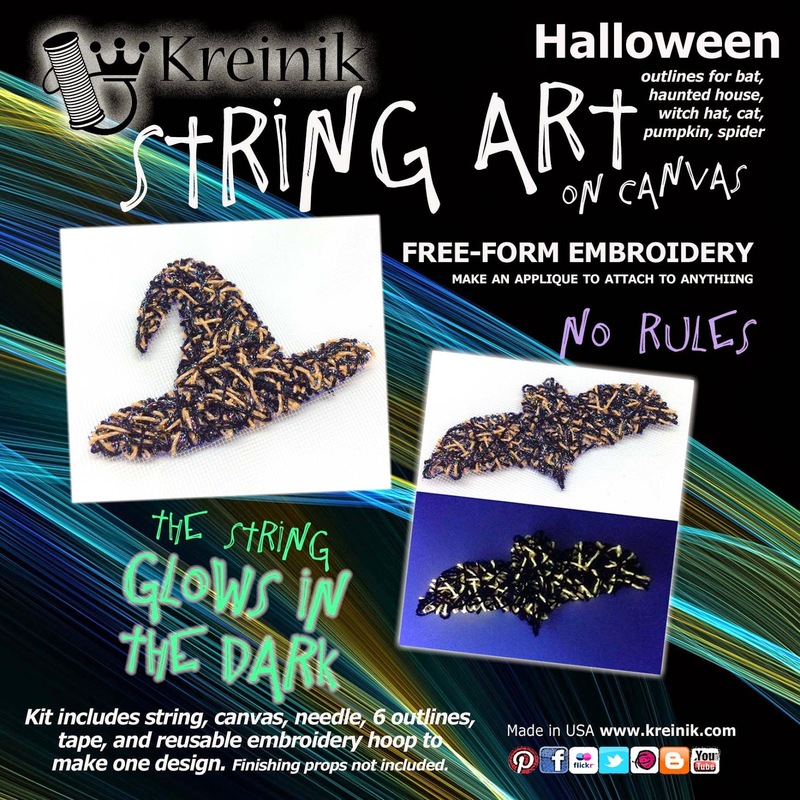 Each kit includes design outlines, thread (the string, some of which glows in the dark), needle, Polysil™ canvas, and reusable embroidery hoop. You even get double-sided tape to attach your string art to anything, such as a notebook, cosmetic bag, sleep mask, or anything your heart desires. String Art isn't just for the young, mind you. Anyone wanting a quick, low-stress, colorful thread project will love these string art kits. You get self-expression and creativity without charts, order, rules and critique. Anyone who fears doing something "the wrong way" needs to make a Kreinik String Art On Canvas project. There is no wrong way to stitch one. Mental health note: once you learn to let go, you relax, and the creative freedom feels wonderful. So no matter your age, your mission is to explore the exciting world of String Art On Canvas, to seek out free-form creativity, to boldly stitch on something you may not have tried before. Stitch long and prosper. We have informative discussions on the Kreinik Facebook page with the community of stitchers sharing tips whenever someone has a question. 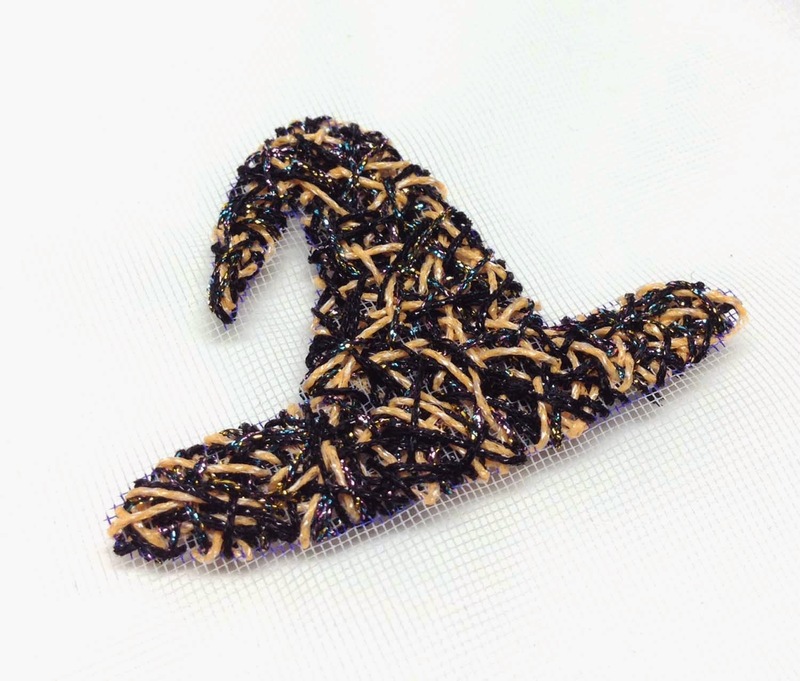 It's a convenient place to share stitching tips, project ideas, and needlework community news as well as a place for announcements about Kreinik thread. Like our Facebook page to you can visit by clicking here. Recently a stitcher who wanted to create her own needlepoint designs asked us: "Is there a pen that can be used on needlepoint canvas that won't bleed?" We posted it on Facebook, and it became one of the most viral topics we've seen in awhile. In case you want to create your own designs, we are posting some of the answers below. "I use Pigma or Micron for fine lines and Sharpies, usually in pale colors, for thicker ones." - Marjorie H.
" How about griffon…I hate spell check make that frixion pen made by pilot. They are heat sensitive so even if the bleed with a little heat, the ink will disappear." - Mary L.
"Zig Markers - been using them for years - Fleur de Paris was the distributor--usually can find them in a good art supply store." - Carolyn T.
"People before commented that Micron was the best…" - Ann L.
"I asked this question a couple of months ago and the responses were Identpen, Zig fabric and a couple of others. Of course I have not been able to find any locally. Others also said not sharpie on canvas. It was a huge discussion with many posts to blogs etc. Use the search feature of facebook to find lots of info from that post." - Lisa P.
"Def Sharpie" - Zarina A. "Sharpie fine point." - Judy C.
"Sharpie makes a fine-point pen." - Karen C.
Stitchers and DIYers are all about personalization these days, stitching specific words, phrases, even texts and Tweets that are meaningful. These finished projects make great gifts since they are so people-specific. The next time you want to create your own needlepoint design on canvas, use these suggestions to outline, then fill in with stitches of colorful Kreinik threads. And we are now on Pinterest! 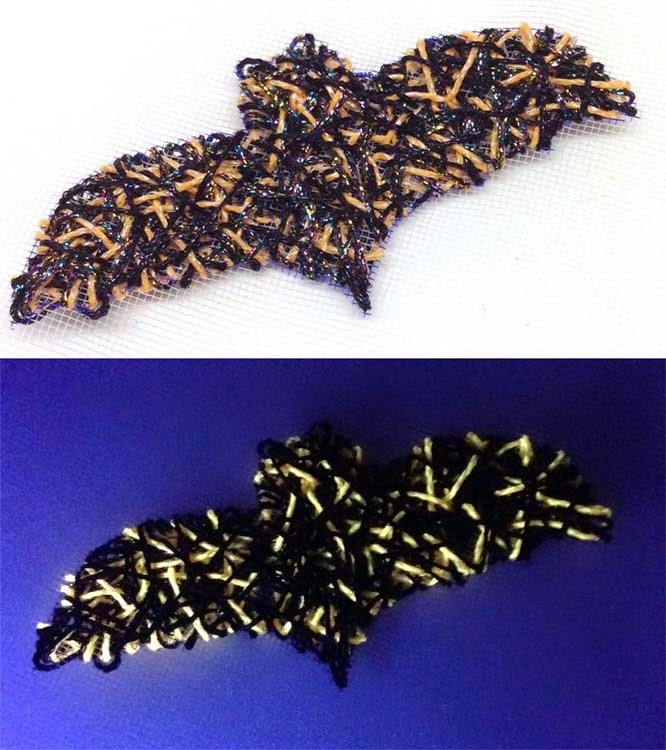 Follow our photo/idea posts at http://pinterest.com/kreinik/ If you post photos of your projects stitched with Kreinik, be sure to add "Kreinik" in the comment section so we can find you.